Groundwork Lawrence hosts a variety of garden workshops to show folks fun and easy ways to grow their own food! Interested in growing your own herbs, tomatoes, lettuce or other vegetables, but you're not sure how? This workshop will help you get started. Would you like to learn how to save money by starting your garden with seeds instead of buying starter plants? Then join us! Learn about the importance of soil and how to create and add your own compost to create nutrient rich soil for a thriving garden. For more information or to register for any of these garden workshops, contact Maria. Opened during the Spring of 2012, Costello has 32 raised garden beds and serves as an urban farm teaching tool for Green Team. 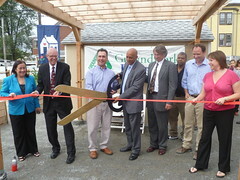 The Spruce & Myrtle Street community garden was opened in July 2011 with a ribbon cutting ceremony, as shown in the photo. At the ceremony, Mayor Lantigua noted, "If you came by this site last year you would have seen a lot with illegal dumping and littered with debris. 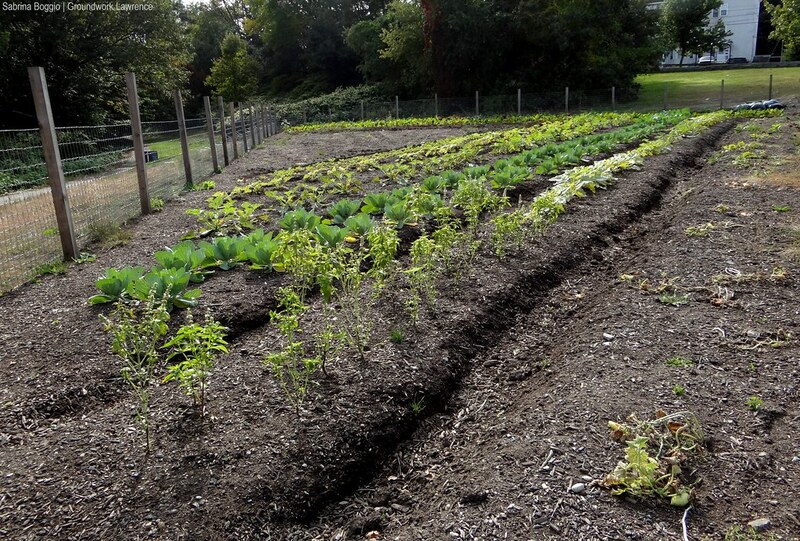 Now we have given the land back to the community for a positive use.” The garden filled up very fast and is already producing fresh produce for the local gardeners! This garden, located at the intersection of Cross Street and Cedar Street, opened in July 2011 and is also full at this time. It was established to provide Lawrencians with another healthy space to grow fresh fruits and vegetables.The site has been a residential space since 1888, but the buildings were demolished in recent years, leaving a vacant lot. With help from the City of Lawrence, GWL transformed the lot into a functional garden! The Giuffrida Place Garden is the last of the three gardens that were established in July 2011. The site historically had three triple-decker residences which were destroyed by fire in the 1990s, and once vacant, became overgrown and filled with a significant amount of illegally dumped material. Local residents quickly jumped on board after hearing about the garden, so the Giuffrida Garden is also full. In July of 2010, Cronin Park, had its official ribbon cutting. There are currently 9 raised garden beds (18 gardening spaces) at this location! 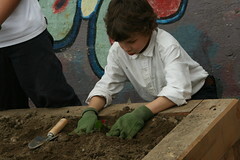 At the time of its opening, local students helped plant veggies in two of the new garden beds that the Tarbox School then used for schoolyard gardening education that fall! Along with the Manchester Street Park, the Manchester Street Garden was opened in the fall of 2009. 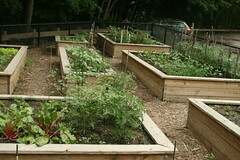 This garden contains 31 raised beds and a compost station. The Manchester Street Park offers great new green space and serves as a spectacular anchor for the developing Spicket River Greenway. The Brook Street Gardens are located at Dr. Nina Scarito Park and were opened in 2006. This site was the product of a 6 year process to bring a safe and fun park and garden site for community members to utilize. Residents use the 17 raised garden beds at this location to grow a variety of flowers and vegetables as well as herbs used for cooking. 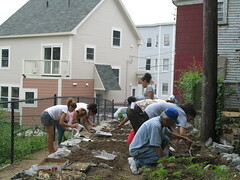 Groundwork Lawrence, through its land trust subsidiary, GWL Recreational Access, Inc. established Lawrence’s first community garden with the building of the Union & Mechanic Alleyway Garden in April 2006. 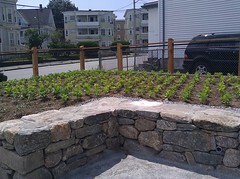 The Union & Mechanic Alleyway Garden contains 8 large raised beds with a total of 16 gardening spaces. The Union & Mechanic Gardens use a palette of Low-Impact Development (LID) strategies that are implemented on-site so that each redeveloped lot and the garden alleyway can capture and percolate surface water on-site, rather than designing the site to rely on the city’s water sources. Learn more about GWL's Union/Mechanic Garden. In 2017, the ribbon was cut on the community garden at Redeemer Lutheran Church. This is GWL’s first community garden build done in partnership with a church. Initially, the thought was to put 2-5 beds but once the land was surveyed we were able to put 18 beds of varying sizes. The mission of the Church to become part of the neighborhood was the catalyst to join forces with GWL to build the garden and to bring folks throughout the neighborhood to the church and help increase fresh food access for people in the city. In 2018, Groundwork Lawrence was joined by the Green Team and various city officials to celebrate the transformation of an “eyesore” vacant lot into a community garden. GWL’s Environmental Technical Training program was instrumental in building the beds and grading the sight, while community members along with the city’s DPW and Green Team put the final touches on the space. 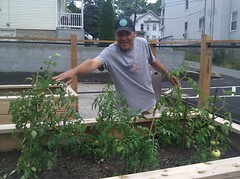 The lot on Lowell and Margin streets was turned into a garden to allow residents to grow fresh food. In 2018, GWL partnered with St. Andrew’s Church, Methuen Arlington Neighborhood, Boy Scout Troop 83, residents, local businesses and parishioners to build Methuen's FIRST community garden. It's a fabulous example of the teamwork that goes on within the City of Methuen. 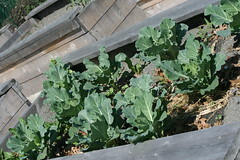 The 14-bed garden is located on church property and is managed by GWL. For more information on any of our fresh food programs email Maria or call her at (978) 974-0770 x7006.